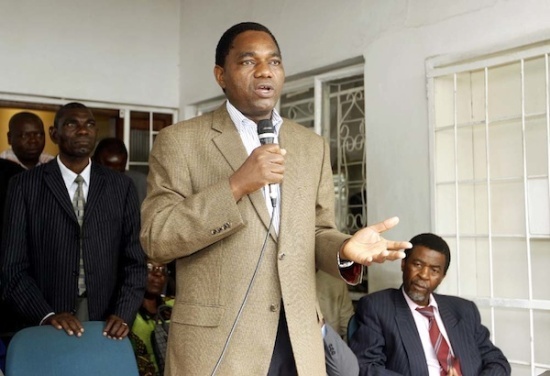 The United Party for National Development National Management Committee has unanimously resolved to field party president Hakainde Hichilema as the candidate in the forthcoming presidential by election. Party vice president Dr. Canisius Banda told a media briefing at the party secretariat that the decision was unanimously arrived at yesterday at a meeting also attended by all the party’s MPs. He added that his party was ready for the election and urged people to rally behind UPND because the party has demonstrated consistency and readiness to grow the economy. Dr. Banda said when voted into power, UPND shall continue with infrastructure development like roads, schools, hospitals and others but will not tie the country to debts. He said that the UPND government will use money from within the country through prudent management of resources which will result in cost saving measures. He stated that his government will reverse the wrong policies and decisions made by the PF such as the indiscriminate dismissal of nurses, whom he assured of immediate reinstatement. And party chairperson Mutale Nalumango condemned the PF internal violence. Nalumango urged the warring PF cadres not to fight on the roads and in government offices because these were public facilities. “My warning to PF is that they should restrict their fights to their secretariat, ifv they want they can hack each other there but not the indiscipline they have shown of fighting in streets and locking up public offices. If Zambians vote for them the next thing they will do is to lock the Presideent’s office. We cannot be surprised because the late President Sata openly confessed that he had useless MPs and ministers,so whoever is going to be picked is a useless candidate and Zambians must reject him,” said Nalumango who is also former deputy speaker of National Assembly.